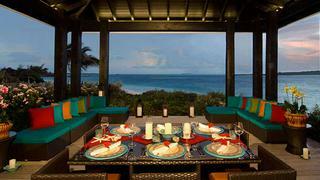 It is little wonder that the Bahamas have long been associated with the jet-setting beau monde. Boasting more than 700 islands, cays and islets to explore, this region is ripe for the yachting aficionado. Located towards the south of the Bahamas, in the heart of the Exuma Cays lies a haven of tranquility: private island resort, Over Yonder Cay. We speak to Dr Ed Bosarge on the creation of his eco-island paradise. Although not officially owned by Dr Ed Bosarge himself but the Bosarge Family Office, he did spearhead the entire project from conception to realisation. It was his vision that created this 72-acre island paradise built to conform to its natural environment. His mission was to be as eco-friendly as humanly possible. “Let’s make the whole island green. Let’s do wind, let’s do solar and let’s do tidal,” Mr Bosarge declared to his developers. This once remote fishing outpost, following five years of remodeling work, now houses four luxurious villas, a nine-hole golf course, a private deep-water marina and pavilion, all to rent exclusively. The island creates over 95 per cent of its energy needs utilising natural elements such as wind and sun. Dr Bosarge has been an ambassador for green living for many years and is the pioneering force at Over Yonder Cay. Presently, the island produces a lot more energy than needed via its three Northern Power Systems 100KW wind turbines and the solar field consisting of almost 1,400 photovoltaic panels allowing Bosarge to put into action new plans for the island. “Now that we are producing excess electricity we are buying two more water makers and going to produce a garden [to cultivate the land for crops etc],” states Bosarge. This will certainly make the resident chefs happy and push the island one step closer to being fully self-sufficient. There are four exceptional villas on the island – each designed with a Minoan-inspired theme – sleeping 28 people. The ultimate in privacy, the villas can be found dotted around the island in secluded, hide away locations. All have master suites, hot tubs, fire pits and entertainment amenities. Villa one is set high on the island’s central hilltop boasting impressive panoramic views of the island and ocean. Villa two has a beachfront location. Villa three looks out over Exuma Sound from its elevated position and finally Villa four has an unrivalled position owning views of both the sunset and sunrise. The well-established deep-water marina is there for exclusive use by the island’s guests. It is a feature Bosarge felt passionately about having a background of sailing and owning two yachts himself; Marie (named after his wife) and Tenacious. “The marina can hold up to eight 150-footers. We have the deepest marina in the region, 13 feet. So you can bring any size boat in,” explains Bosarge. The marina can also supply vessels with water and shore electricity. 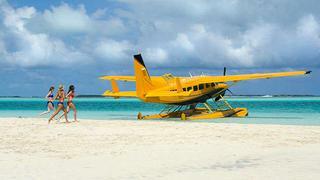 It is the ideal stop when cruising out of Florida and around the Bahamas. Why come to the island? Located in an area of outstanding natural beauty, Over Yonder Cay fuses luxury living with an environmentally conscious ethos, offering a vacation in which it is entirely possible to be in total privacy for your stay. Bosarge’s yachting years really shines through with the resort’s ‘on land yacht’ approach to hospitality. Over Yonder Cay is a private island retreat just hours from the bustle of Miami.